WORCESTER, Mass.–Tropical forests in the Amazon, Indonesia, and Mesoamerica face multiple threats from mining, oil, and gas extraction and massive infrastructure projects over the next two decades, according to a study by Clark University researchers and their international colleagues in the Proceedings of the National Academy of Sciences (PNAS). This encroachment not only threatens forests and biodiversity but also indigenous and rural communities. Across the world, governments and investors are teaming up on huge regional development projects to build roads, railways, port facilities, and waterways. Their goal is to access areas deep within the forest that are rich with known and potential mineral, oil, coal, and natural gas reserves along with other natural resources, the authors point out. “Governments have made framework policy commitments to national and cross-border infrastructure integration, increased energy production, and growth strategies based on further exploitation of natural resources. This reflects political settlements among national elites that endorse resource extraction as a pathway towards development,” according to the authors of “Resource Extraction and Infrastructure Threaten Forest Cover and Community Rights,” an article published December 3 in PNAS. 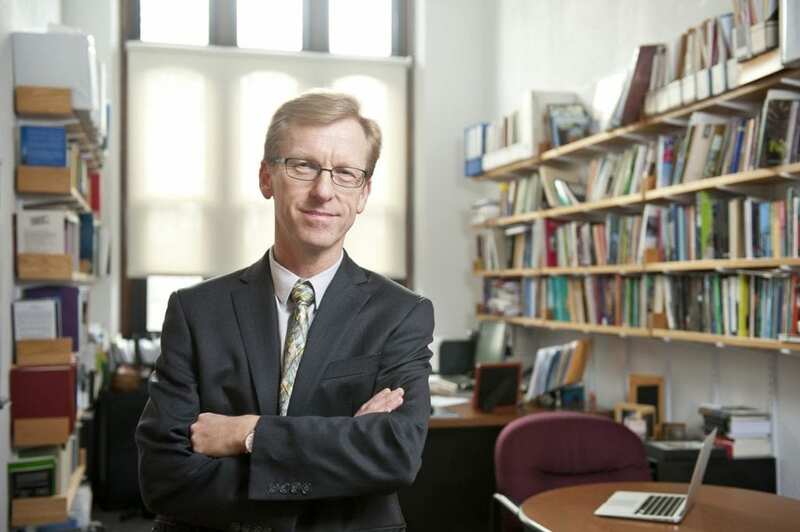 Five of the 12 authors have Clark ties, including lead investigator Anthony Bebbington, a Fellow of the National Academy of Sciences and the Milton P. and Alice C. Higgins Professor of Environment and Society and former director of Clark’s Graduate School of Geography. Currently, Bebbington is serving as Australia Laureate Fellow at the University of Melbourne. The other authors include Denise Humphreys Bebbington, research associate professor in Clark’s International Development, Community and Environment Department; and three more researchers associated with the Graduate School of Geography: Laura Aileen Sauls, a doctoral candidate; John Rogan, associate professor; and Kimberly Johnson ’16, M.S.’17, who graduated from the Accelerated B.A./Master’s Degree Program in geographic information sciences and now works as a data mapping analyst at the Institute for Health Metrics and Evaluation in Seattle. The Clark researchers partnered with researchers and officials from community- and environment-focused NGOs and academic institutions in Indonesia, Brazil, Peru, the Netherlands, El Salvador, and Australia. The researchers used geospatial and qualitative data, including that gathered through interviews and workshops with stakeholders in Brazil, Indonesia, Peru, Mexico, Norway, and El Salvador. Past research has shown that the expansion of infrastructure has led to deforestation, they say. But fewer investigators have studied how the complex interactions between two massive forces — infrastructure investment and resource extraction — have combined to threaten forests and communities, according to the authors. They stressed the urgency of this research, given the monumental infusion of government support for development across the world. In 2014, for example, the Group of 20 — an international forum of governments, including the United States — “committed to invest up to an additional $90 trillion in global infrastructure by 2030, and in 2016 committed to link infrastructure master plans across world regions,” the authors note. They urged researchers to shed light on governmental corruption and human rights abuses that often accompany these massive investments, and to promote policy-making that protects forests and communities. In Honduras, for example, violence and murder surrounded the Aguas Zarcas hydroelectric conflict in 2016. Examples include zoning to set aside forest areas and maintain communities; energy strategies focused on reducing dam building and fossil fuel extraction and eliminating coal; community-based forest management; financial incentives to decrease forest conversion; promotion of socially and environmentally responsible manufacturing and production; and especially important, a substantial community and human rights agenda. The authors spell out converging patterns of resource extraction and forest loss. The direct impacts of mining and oil and gas extraction on forests were limited from 2000 to 2014, they say. However, there were exceptions. Forests were particularly affected by coal mining in Sumatra and Kalimantan; iron ore mining, charcoal and pig iron production in Brazil; and artisanal and small-scale gold mining in Madre de Dios, Peru, along rivers in the Brazilian and Colombian Amazon, across Kalimantan, and in Nicaragua. On the other hand, forest loss and degradation has resulted more from the indirect impacts of resource extraction, combined with infrastructure investment. When roads are built to access resources, the government “signals” that those areas might be settled and developed. This phenomenon has occurred in places like the Petén region in northern Guatemala and in Madre de Dios in southeastern Peru, part of the Amazon Basin. After the construction of the Southern Interoceanic Highway linking Brazil and Peru, for example, artisanal and small-scale gold mining intensified. In the future, mineral development could expand elsewhere in the Amazon Basin given large-scale commitments to invest in roads, waterways, and railroads as well as phenomena such as Venezuela’s designation of a “mining arc” covering 12 percent of its territory, now under military control with suspension of constitutional rights. In Indonesia, forests and communities in Kalimantan are threatened by coal mining and a proposed railway running through the forest to a coastal port. Meanwhile, governmental policies that promote growth will have major impacts on forests and contribute to increased greenhouse gas emissions, the authors say. They cite as examples Brazil’s Growth Acceleration Program, building highways, waterways, and hydroelectric power plants across the Amazon; Honduras’ investments in hydroelectric energy, mining, and petroleum exploration; and Nicaragua’s focus on gold mining and exports. This political commitment to infrastructure projects without sufficient consideration of possible social and environmental impacts is also apparent at a subnational level where regulations are even weaker. This has led to further overlaps with indigenous lands and protected areas as in the case of Loreto, Peru, notes co-author César Gamboa of Derecho, Ambiente y Recursos Naturales (Law, Environment and Natural Resources), an NGO based in Lima, Peru. Added to that are multi-state infrastructure and energy agreements, including major initiatives that will increase transportation across the Amazon and Mesoamerica and deepen integration across the Indonesian archipelago. “What happens to the forests of Amazonia, Indonesia, and Mesoamerica over the next two decades will depend on which claims over these forests prevail in these contestations over land use,” the authors conclude. Founded in 1887 in Worcester, Massachusetts, Clark University is a liberal arts-based research university addressing natural, social and human imperatives from local to global scales. Nationally renowned as a college that changes lives, Clark is a transformative force in higher education today. LEEP (Liberal Education and Effective Practice) is Clark’s pioneering model of education that combines a robust liberal arts curriculum with life-changing world and workplace experiences. Clark’s faculty and students work across boundaries to develop solutions to complex challenges in the natural sciences, psychology, geography, management, urban education, Holocaust and genocide studies, environmental studies, and international development and social change. The Clark educational experience embodies the University’s motto: Challenge Convention. Change Our World.